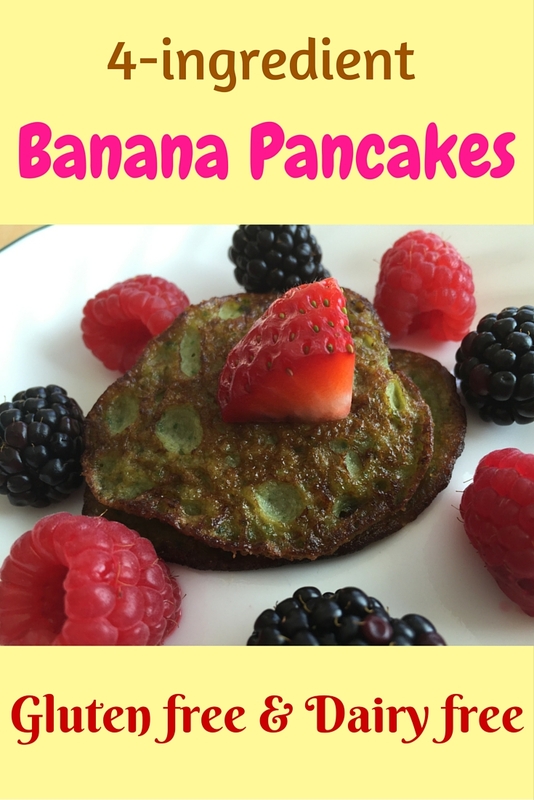 The first time I read on the internet about 2-ingredient banana egg pancakes I thought: That is a great idea! It turned out that banana egg pancakes were not only easy to make, but also delicious. My whole family loved them. One day, I decided to add more nutrition to these pancakes (by adding fresh spinach leaves) and more flavour (by adding vanilla extract). Still delicious and easy to make. Mix all 4 ingredients in a blender and blend for 1 minute. After 5 minutes in the pan your first batch of delicious banana pancakes is ready. Toppings – coconut butter, maple syrup, raw honey, jam, cashew butter, etc. Place the first 4 ingredients in a blender and blend for 1 minute. Heat up a frying pan on medium heat and drop in 1 tablespoon of coconut oil. Drop spoonfuls of the pancake batter onto the heated frying pan. Do not make the pancakes too big as they will be difficult to flip (these pancakes are very delicate). Flip the pancakes when they are lightly brown on the bottom. Be careful as the pancakes are fragile and flipping them is a bit tricky. To keep the pancakes warm, place them on a plate in an oven warmed up to 170 F.
Top them with your favourite toppings and enjoy! Here is another delicious and easy pancake recipe: 5-Ingredient Beet Pancakes. Have you ever made banana pancakes? How did they turn out?